If you’re looking to shed some pounds and tone your body without having to purchase expensive workout equipment or a gym membership, then you’re in luck. Power walking provides a great workout that poses many physical and mental benefits. Best of all, it’s free! While power walking may not sound as vigorous an activity as running or strength training, it’s a very powerful workout. Power walking involves the intense movement of your arms and feet, which works your muscles and burns calories. By power walking a few times a week and maintaining a healthy diet, you can shed unwanted pounds and maintain a leaner physique. Power walking helps minimize stress and improve mood. The exercise releases endorphins in your brain, causing you to feel calmer and more relaxed. Power walking also takes your mind off the stress of your work or home life and leaves you feeling refreshed and rejuvenated. Power walking regularly can help reduce your risk for illness and disease. The exercise can help lower bad cholesterol levels, decrease blood pressure, and reduce the risk of illnesses, such as type 2 diabetes, cancer and stroke. Power walking works both your upper body and lower body strength, which strengthens your muscles and bones. This heightened strength will increase your ability to perform tasks that were once challenging, such as lifting heavy objects. 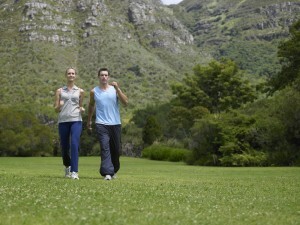 With power walking, you can tone your body and reduce stress without spending any money. The activity can be performed without any equipment or a gym membership. You can power walk in the early morning, on your lunch break or after dinner, wherever you are. This makes the exercise extremely convenient and time-efficient.